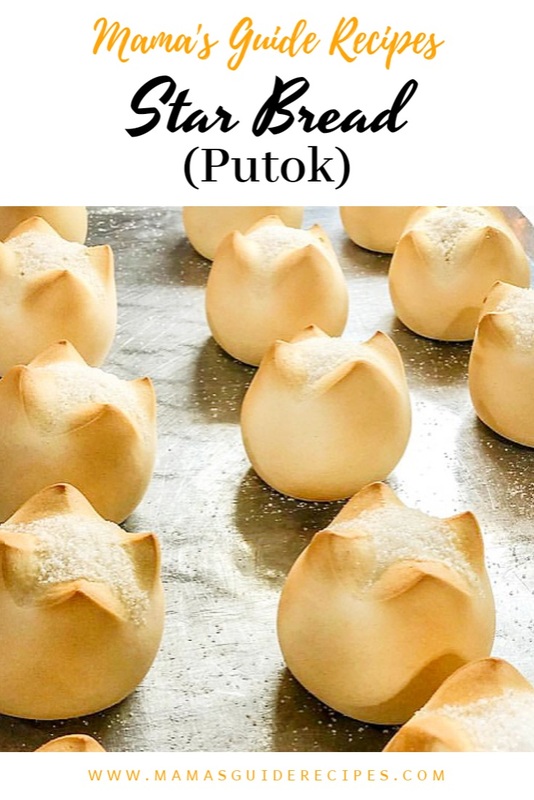 This Star Bread Recipe also known as Putok bread is a favorite afternoon snack in the Philippines. The bread was called as such because of the trademark crack on top, which looks like it has exploded. Others will also call it Pinagong because of the slash in the center of the bread instead of the Star cut. Whether you call it Pinagong, Star Bread, Pan Bonete or Putok, these bread are all the same. It is a sweet bun with a bit hard, shiny crust but has a tucky soft sweet and milky crumb with lots of sugar sprinkle on top. Best to eat when baked fresh. Enjoy! 1) In a large bowl, mix warm water (110 degrees), 1 tbsp sugar, and instant yeast. Stir until well combined. Set aside in warm place for about 10 minutes or until foamy, bubbly and the yeast is activated. 2) In another bowl, add flour, remaining sugar, milk powder, and salt. Mix until well combined. 3) Add in warm milk, softened butter, and yeast mixture into the flour mixture. Manually mix it using a wooden spoon until it becomes dough like. 4) Transfer the dough on working table and floured surface. Knead for at about 5 minutes until dough texture becomes smooth and elastic. Shape it into a big round ball. Then transfer in an oiled bowl and cover with plastic wrap or a damp cloth. Set aside in an unused oven or warm place for about an hour. Or keep it in a cabinet with limited air or keep it away from air. 5) Punch the dough in the middle after an hour. Knead it again and form it into a log shape. Divide the dough into 4 logs. Slice each log in half and shape into a round ball. Make a deep slash in the center of the dough for pinagong bread. For pinaputok bread, make an X or star slice on top of the dough. 6) Transfer the dough into a baking tray lined with baking paper and grease. 7) Cover the dough with a damp cloth for 10 minutes and let it rest for a moment. To prevent it from being fluffy, avoid letting them rest too long. 8) Before baking, brush it on top with egg wash. Bake the bread in a preheated oven set at 350°F (176°C) for about 20 minutes or until the top is light brown. Remove from oven and let it cool. 9) Sprinkle bread with sugar on top. Serve and enjoy!